This was easy. Fun flowers are my favorite things to draw. I think the vase was one of those pots that went wrong in pottery class. 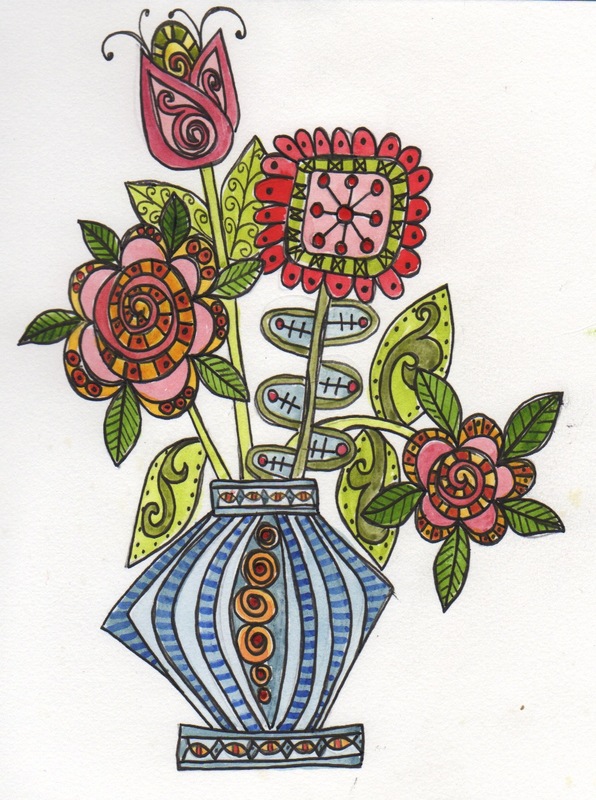 This entry was posted in Uncategorized and tagged blue vase, Day 19, doodling, floral tribute, fun flowers, pink flowers, purple tulip, watercolor flowers by pamelajeannestudio. Bookmark the permalink. You make the most incredible doodles, I think that’s what you call them. Very pretty bouquet! The vase is cool! Yes, I was in doodle heaven with this one. Thanks, Karin. I love it when someone calls me an artist–as I don’t really feel like one as I have no training. Yours was a real “feel good” comment. Thank you, Kathleen. Love all those detailed and rich designs! Yes, you are an artist. Why thank you! I’ll have to start believing it.